How to get an importer status in Saudi Arabia? How to get import licence in Saudi Arabia? 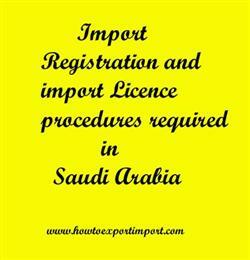 What are the procedures for registration as an importer in Saudi Arabia? How to start an import business in Saudi Arabia? What are the certification formalities to import to Saudi Arabia? This post explains about import registration procedures to be obtained from Saudi Arabia government authority for importation to Saudi Arabia. For those who wish to import to Saudi Arabia, should be register with and get appropriate license or permit from Ministry of Commerce and Investment (MCI). There were many limitations and strict rules regarding import. Every goods imported into Saudi Arabia needs to be accompanied with a SASO Certificate Saudi Arabia. The SASO Certificate, also known as the COC Certificate, or the certificate of conformity certificate, is a must to clear the goods through the Saudi customs for both exporting and importing. The Intertek is the service provider and supports the authorities in Saudi Arabia with the conformity assessment programme. This information is about import licensing procedures to import goods to Saudi Arabia. If you have to add more information about import permit and registration required to import goods to Saudi Arabia, share below your thoughts. What Licence requited to import in Jeddah. What should I do to import goods in Riyadh. How to get import licence in Dammam. Procedure to get registration to import in AL JUBAIL. Mandatory process need to complete import in Medina. First permission required to import in Dammam. How can I start import business Riyadh?. How to begin import trade in Medina? Permission to initiate to import in Jeddah. The way to get registration to import in Dammam. Import registration procedures required in Dammam. Import Licence process in Jeddah. Process to import to Medina. Requirements of registration to import to Riyadh. Registration requirements in Dammam to import. Registration needed to import to AL JUBAIL. How can I register to import in Medina. How to export from Macedonia?